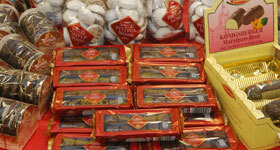 Stollen – a loaf-shaped Christmas cake baked with dried fruit, nuts, and spices and covered with powdered sugar. Ours has a marzipan filling. Lebkuchen – a large round soft gingerbread cookie baked for Christmas. 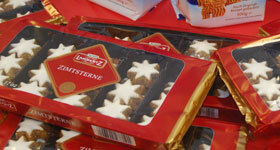 The city of Nűrnberg is known for having the best Lebkuchen and it is where we source ours. Dominos – Chocolate-covered Petit Fours made with soft gingerbread, fruit puree, and marzipan. 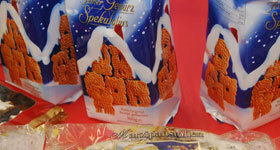 Spekulatius – Traditional spice cookies from Germany, Holland, and Belgium. Made in special wooden molds to create beautiful designs. Pfeffernusse – Round, hard spice cookies with a sugar frosting. Perfect for dunking in hot cocoa.